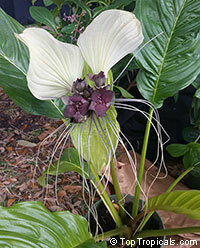 Bat Head Lily, Bat Flower, Devil Flower, Black Tacca. 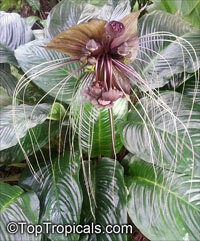 Curious, bat-like inflorescence both in shape and color, with wide spreading, wing-like bracts of rich maroon-black, accompanied by long trailing filaments or "whiskers". 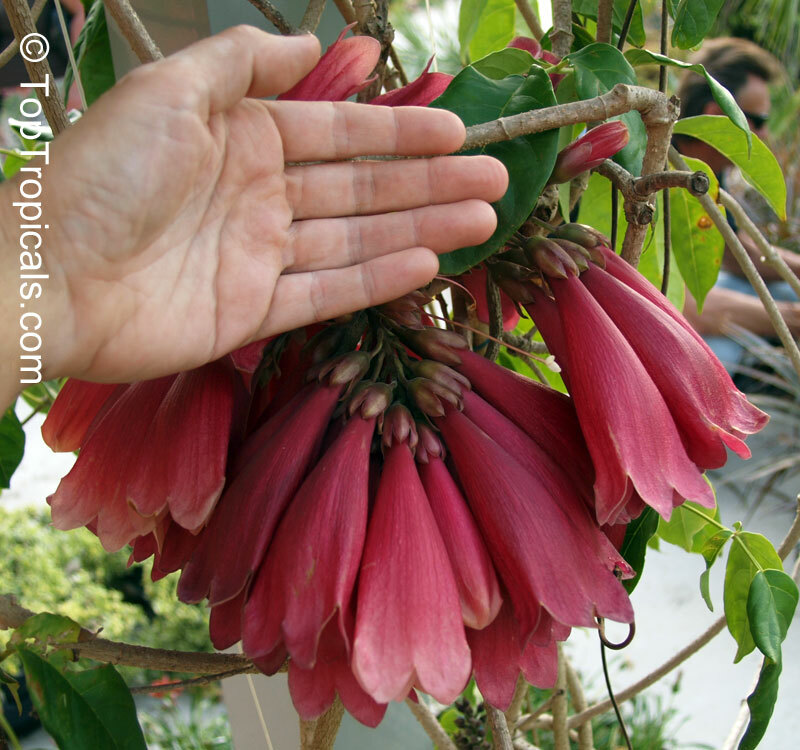 New Guinea Creeper vine. Very showy clusters of flowers with a dark pink tube and spreading creamy-white lobes. Non-aggressive vine. Blooms in Winter. This variety commonly has been called "Salmon" but it fact it is bright orange. We changed the name to avoid confusion with another variety "Apricot" (item 5973) that is closer to salmon color. 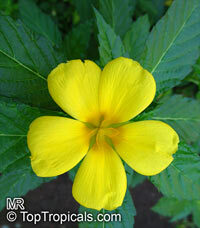 One of the most rewarding flowering plants! 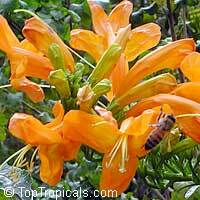 Stunning display of orange flowers year round, from winter through spring and summer. Unlike other tecomarias, it is more of an upright shrub with naturally compact shape and doesn't shoot long leggy branches. 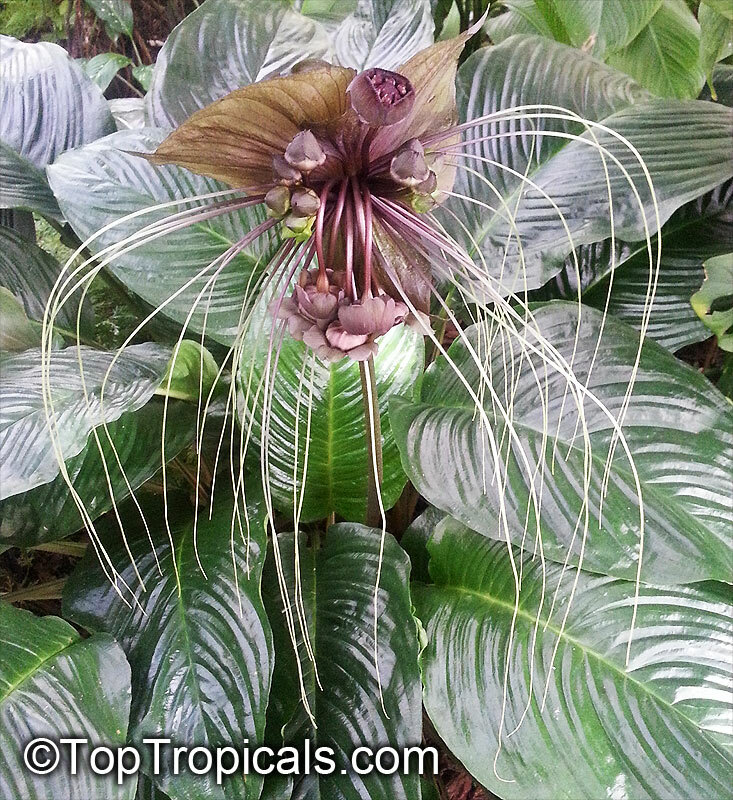 You don't have to prune it, it keeps naturally rounded, bushy shape. Attracts butterflies. 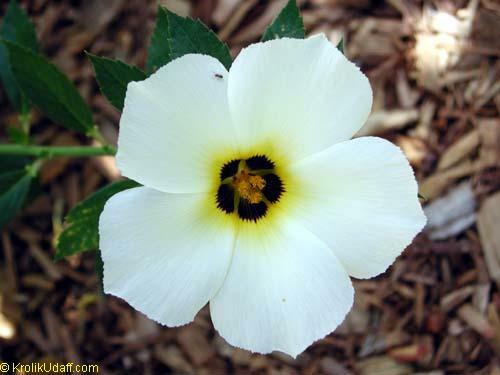 It's an eye catching flower that appears all year round! Pakalana vine, Tonkin Jasmine, Cowslip Creeper, Telosoma. 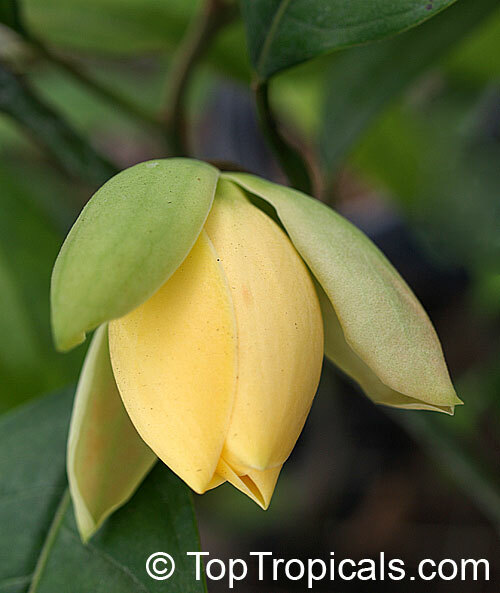 Very heavy lemon-like fragrance similar to Ylang-Ylang. Clusters of golden yellow blooms form along the vining stems during summer months. Individual blooms emerge successively over a period of weeks emitting a rich, heavy fragrance that is reliable day or night. 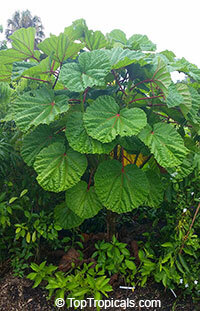 Used for leis in Hawaii, it grows vigorously during the long warm days of summer with growth slowing and eventually coming to a standstill throughout the winter. Hardy Zone 10 and higher. Pakalana vine, Tonkin Jasmine, Cowslip Creeper, Telosoma. Very heavy lemon-like fragrance similar to Ylang-Ylang. 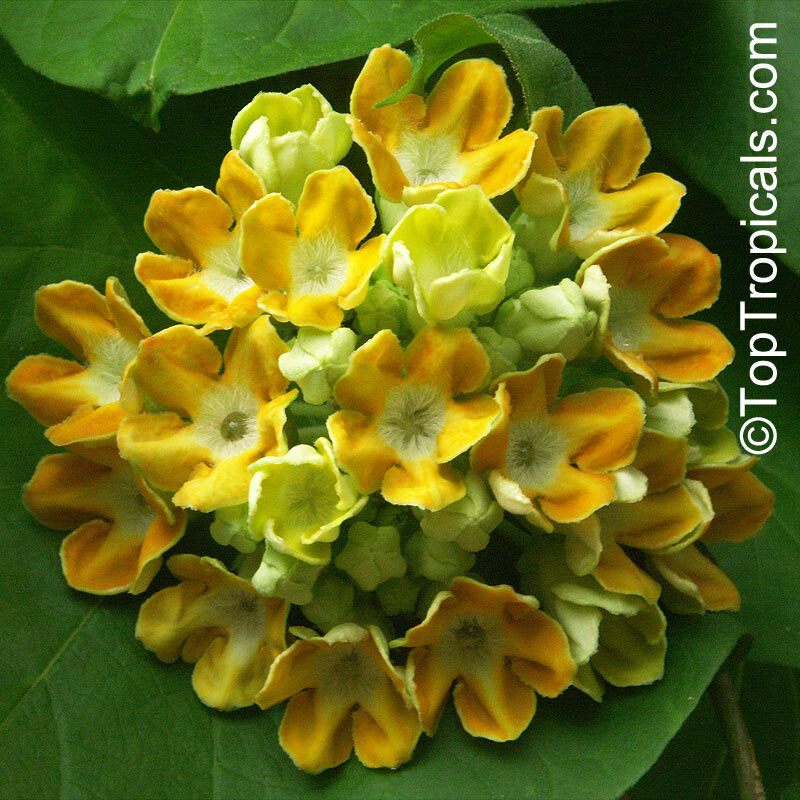 Clusters of golden yellow blooms form along the vining stems during summer months. 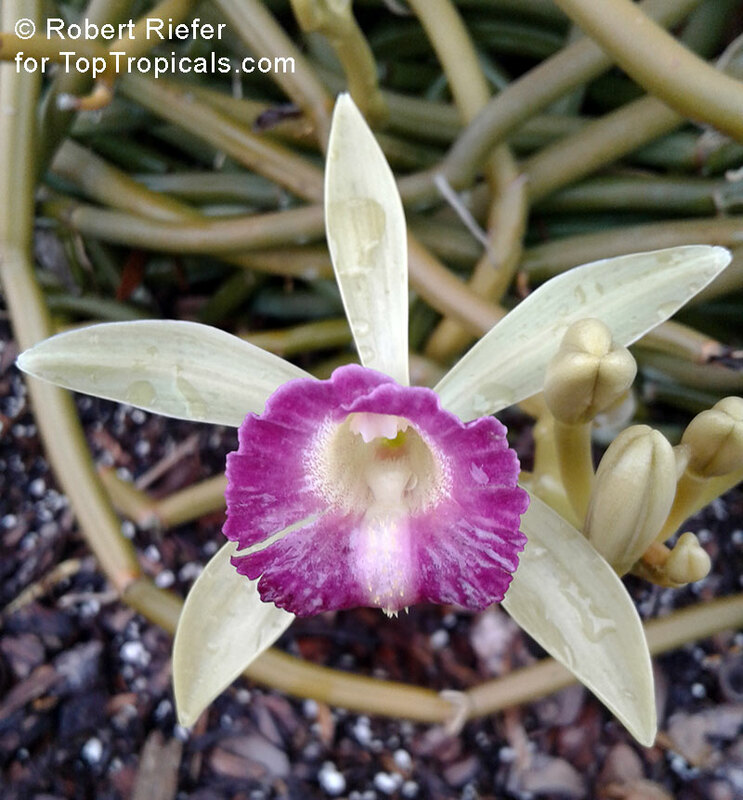 Individual blooms emerge successively over a period of weeks emitting a rich, heavy fragrance that is reliable day or night. 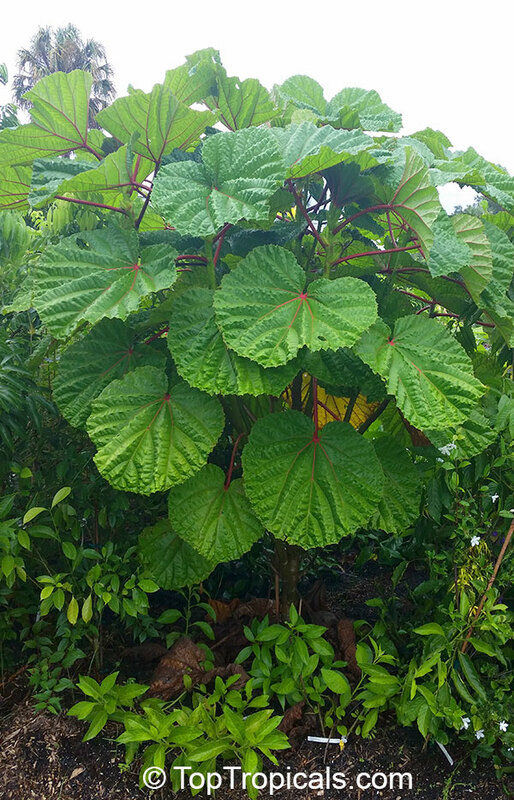 Used for lais in Hawaii, it grows vigorously during the long warm days of summer with growth slowing and eventually coming to a standstill throughout the winter. Hardy Zone 10 and higher. 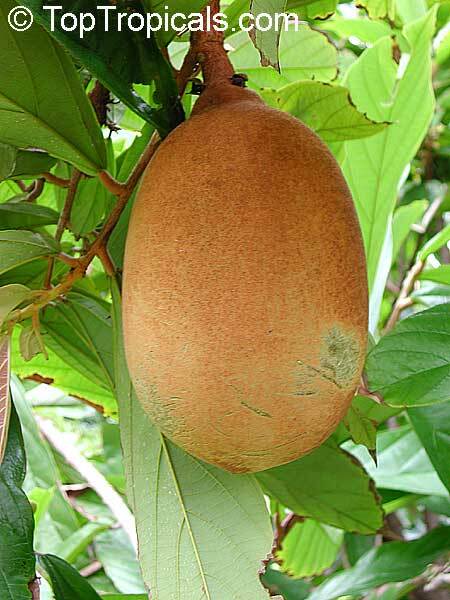 Cupuacu - rare exotic fruit tree. Belongs to the Chocolate family. It is about the size of a cantaloupe and is highly prized for its creamy exotic tasting pulp. The pulp occupies approximately one-third of the fruit and is used throughout Brazil and Peru to make fresh juice, ice cream, jam and tarts. Kings mantle with variegated flower lavender-off-white. Unique, rare variety. 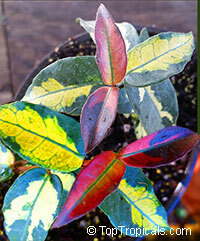 Unlike most variegated plants, this one is very vigorous and easy to grow. 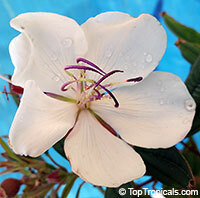 It can be used as a showy garden specimen or as a hedge plant - responds well to pruning which induces flowering. Kings mantle with very light lavender colored flowers. 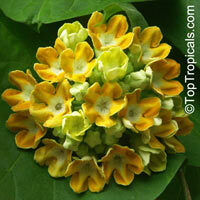 It can be used as a showy garden specimen or as a hedge plant - responds well to pruning which induces flowering. 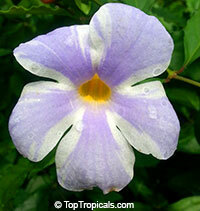 A stunning vine originating from India, one of the most popular species, but hard to find. 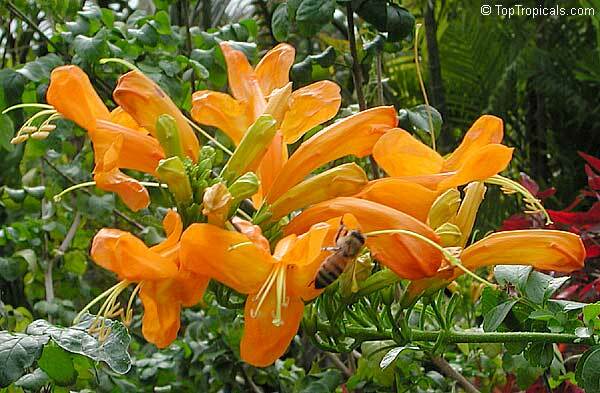 The bright yellow flowers of unusual shape are hanging from the vine in clusters that can cover a large trellis or pagoda. 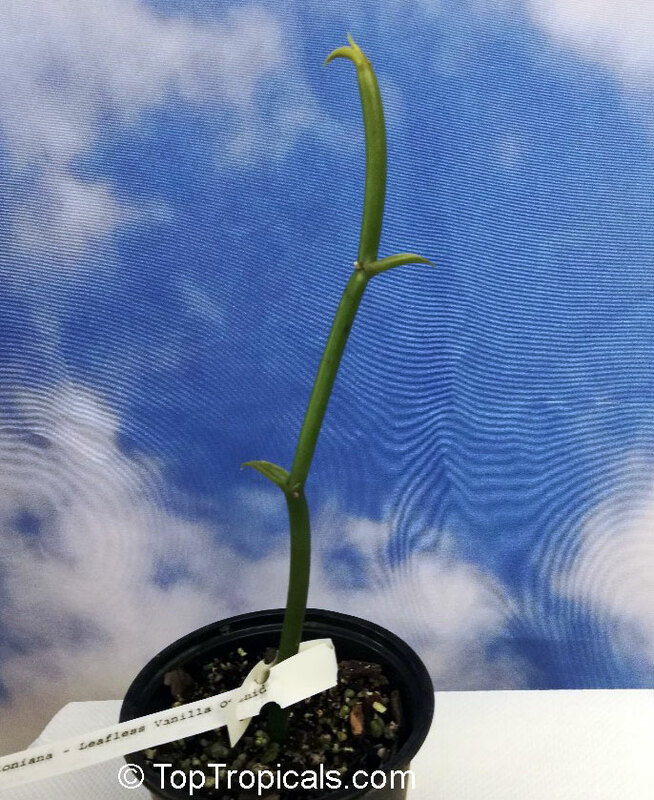 THIS PLANT DOES NOT SHIP WELL. PICK UP ONLY. 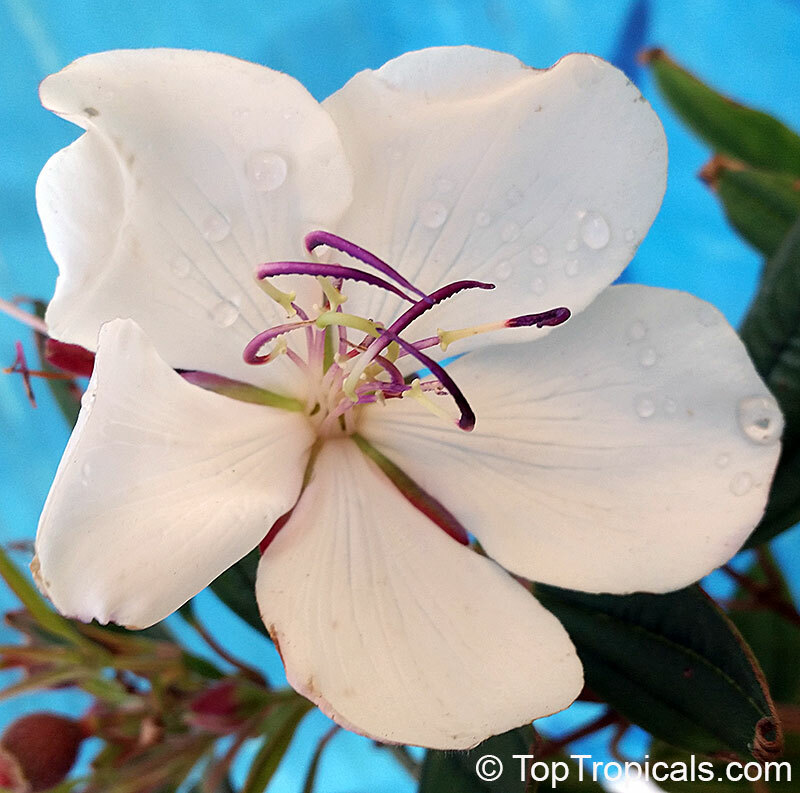 Tibouchina Peace Baby is a new selection bred in Queensland, Australia and has been launched with great success on the global stage. It is one of the most compact forms of Tibouchina currently available, and is a stand out performer in gardens across the country. 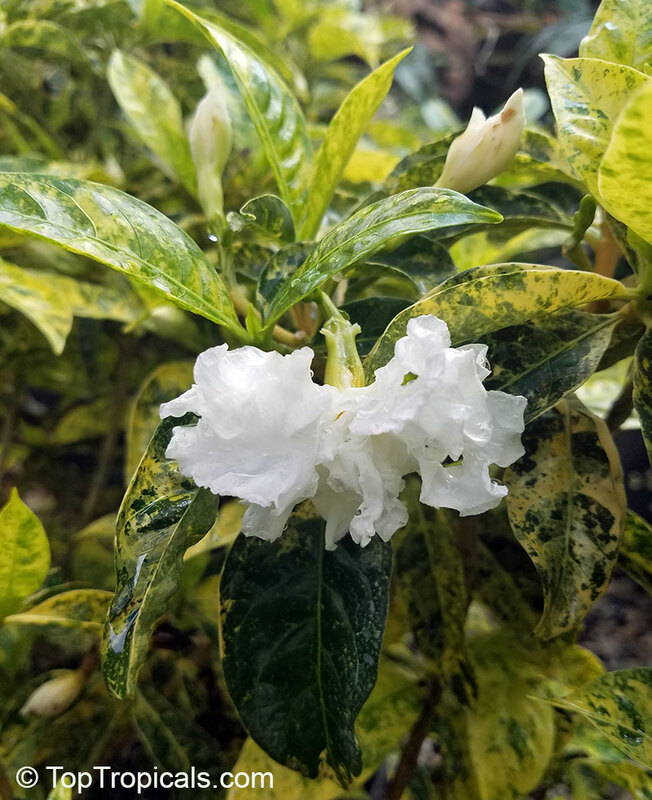 Large, clear white flowers with pink stamens adorn the plant throughout the warmer months providing stunning color for your garden. The bright vibrant flowers are significant both in size and in the number produced per plant, not uncommonly covering parts of the plant to the point that foliage is difficult to see. A dense and compact variety well suited to pots and containers. This variety is easy to grow. This plant doesn't take shipping well. Pick up only! Tillandsias, called by some the world's most unusual airplants, are a delightful addition to any greenhouse. 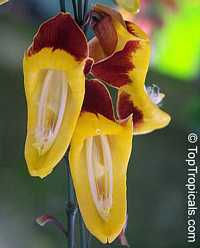 They are easy to care for, exotic to look at, and interesting to study. 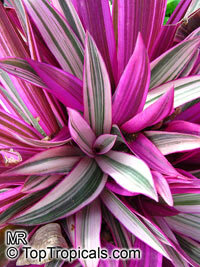 Tillandsias are air plants, even more so than other bromeliads and much like vandaceous orchids. Tillandsia's are without doubt one of the worlds most amazing group of plants. Tillandsias have developed the ability to take all their food and water through specially designed cells on their leaves and therefore can exist without any roots for ever. Roots are used by most species to attach themselves and nothing more. Tillandsias can grow in places no other plants can survive including electrical cable on power lines. They prefer light airy conditions and daily misting in areas of low humidity. 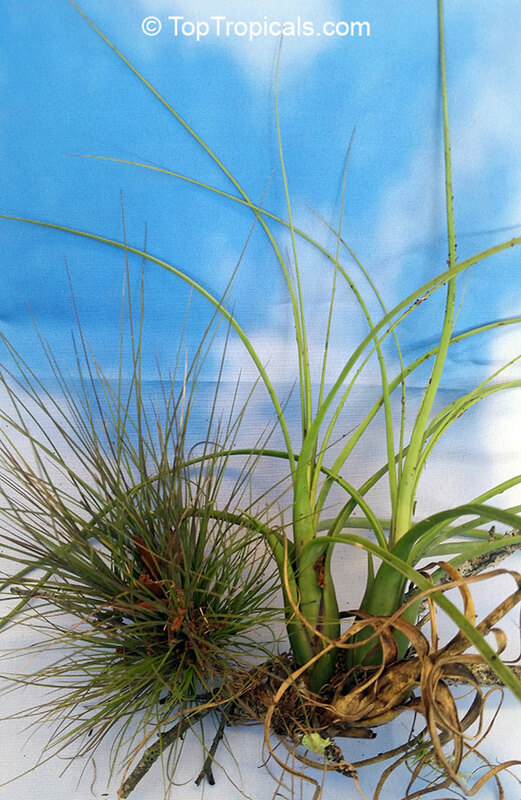 Enjoy your tillandsia plant for years of blooming and pupping with good light, fresh air, and adequate but not overabundant watering, particularly in cooler weather. White Velvet, White Gossamer, Cobweb Spiderwort. Fuzzy leaved spiderwort, appearing as if its leaves were covered with spiderwebs. Silver green leaves frosted with white fuzzy cobwebbing whorled around upright stems. 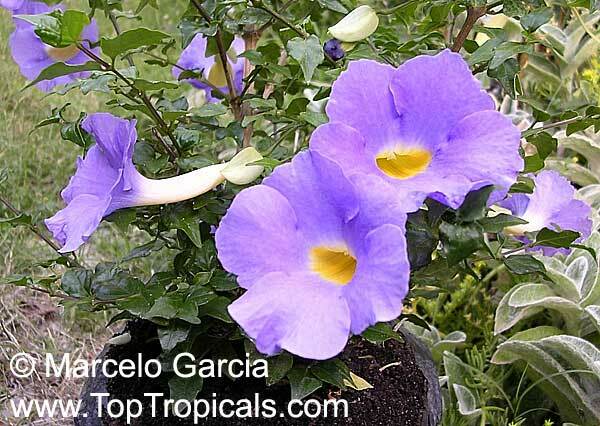 Low growing and spreading, to 10-12" x 18", with striking magenta flowers in summer through autumn. Showy in containers or the garden. Unusual little plant for the rock garden, a pot or the top of a wall. Sun to light shade. 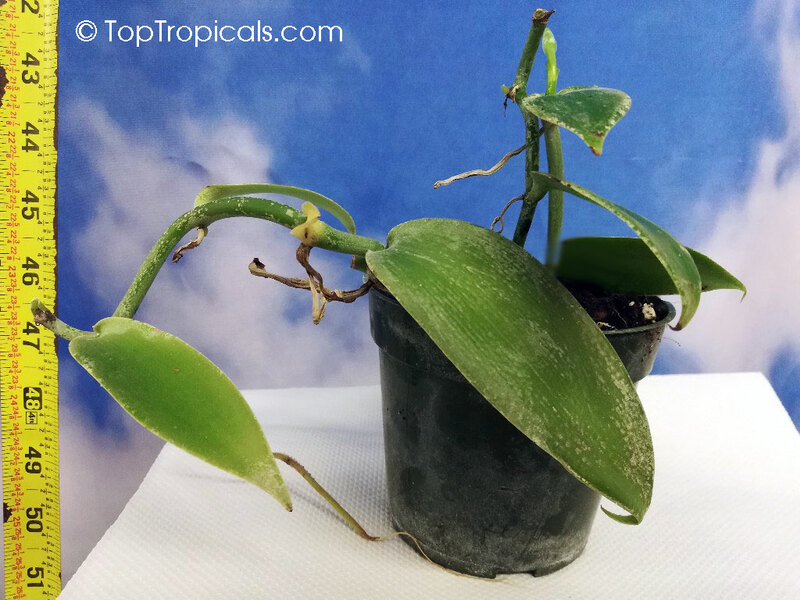 This is a plant that enjoys neglect and mixes well with succulents. Far hardier than appears, this overwinters at light freeze (zone 7B). 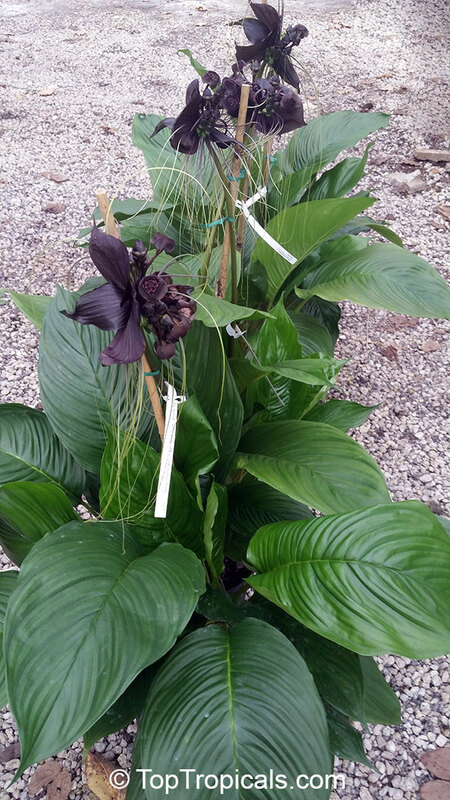 Rhoeo spathacea, Tradescantia discolor - Boat lily, Rheo, Oyster plant, Moses-In-The-Boat. 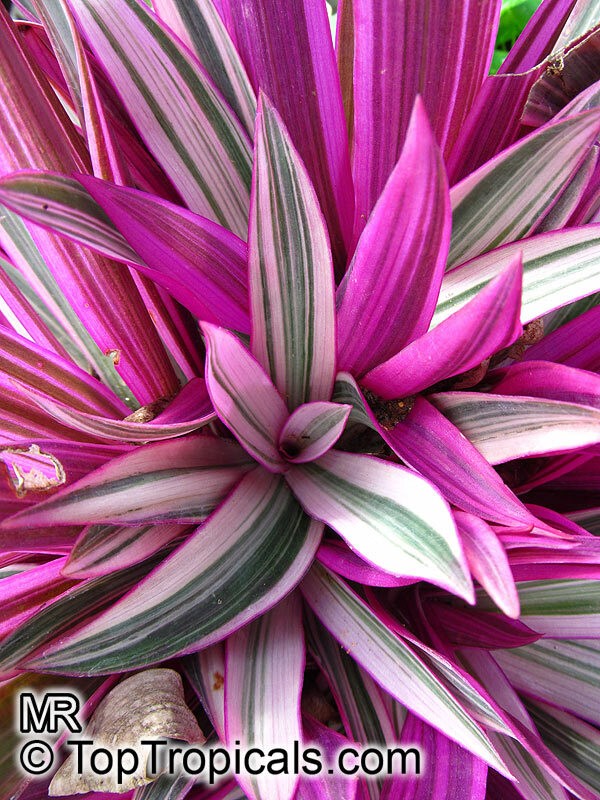 Very bright purple-green-white leaves of this variegated variety make a beautiful ground cover. Easy to grow and fast-spreading. 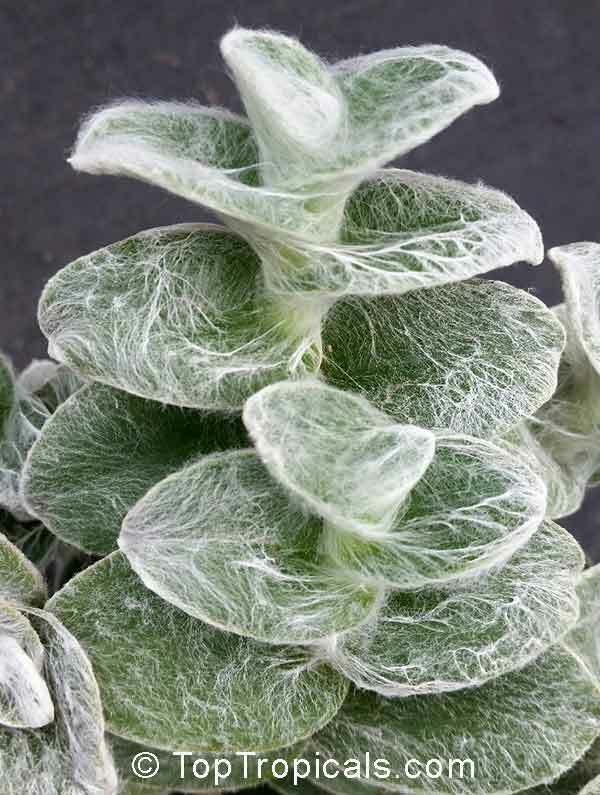 Can be used to make a dense groundcover, as houseplant or in interiorscape. This very rare unusual succulent from Madagascar has spectacular yellow flowers with black centers. 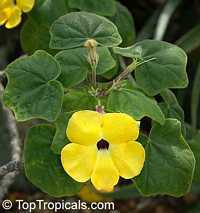 Uncarina peltata is quite rare and not the easiest subject. Grows in well-drained soil, and unlike many succulents, prefers lots of water along with full sun. Forms large caudex. 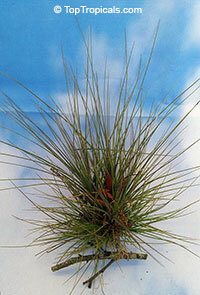 The plant goes dormant in winter and stays leafless during dormancy. 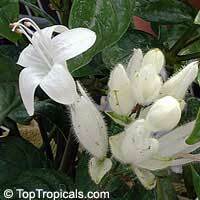 White candles - perfect house plant or shade loving garden specimen. Spires of pure white flowers rise above the dark green foliage with periods of heavy bloom that almost engulf the plant. 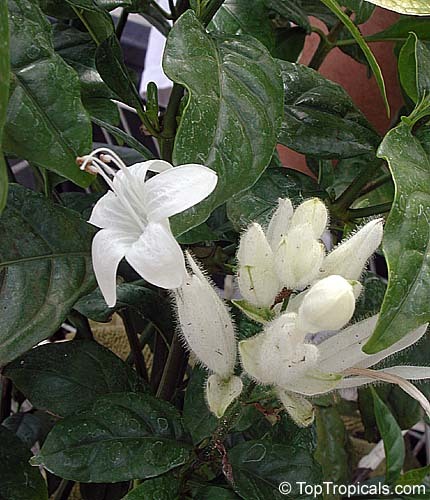 The 1" flowers are comprised of a pure white calyx and a protruding white bloom. 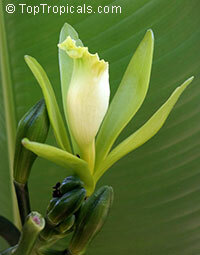 Each inflorescence can reach 4" or more and last for a week. Hardy Zone 10 and higher. 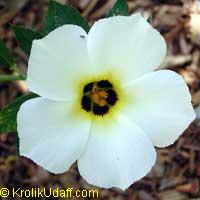 Partial sun to shade, grows to 3' in container, minimum temperature 55F, everbloomer. Perfect houseplant!